To get the information about personalized products bought by a customer, log in to your admin panel, go to Orders -> View orders. Click "View" next to the order and you will get to the order details page. On order details page in the "General" tab you can see a customer's billing and shipping address, billing and shipping information. Also, you can see the description of all design elements of the ordered product. 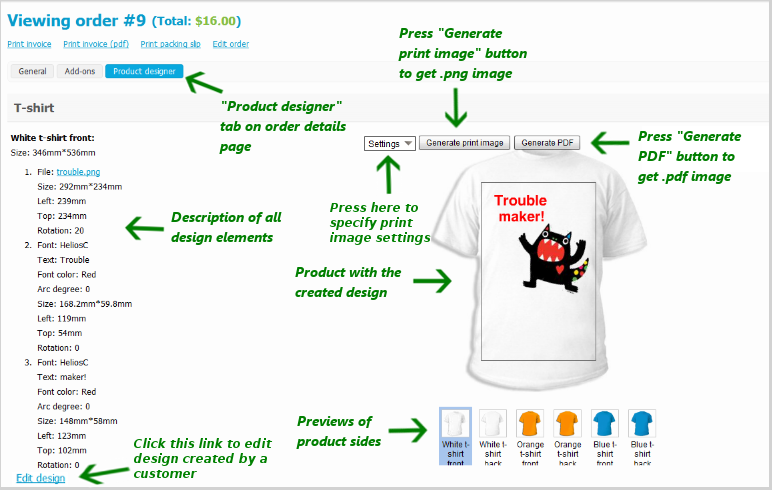 Click "Product designer" tab to get all necessary information for printing. Include product side image - tick this checkbox if you want to get a printable image that includes both a product side image and design elements (good for stickers, cards, etc.). Don't tick this checkbox and printable image will include only design elements (good for T-shirt design, mug design, etc.). Background color - here you can choose a background color for your printable image. Transparent background (not used for PDF) - tick this checkbox if you want to generate a printable image with a transparent background. This setting works for generating a .png image only. Don't tick this checkbox if you would like to use a background color from a Background color picker above. If you are going to generate a .pdf image and don't need any background color, choose white color from a Background color picker above. Image resolution (dpi) - here you can decrease the resolution of the printable image if necessary. It will allow you to generate a smaller picture. For example, you may use this feature to generate an image that can be used as a template to demonstrate what Product designer can do. 2. 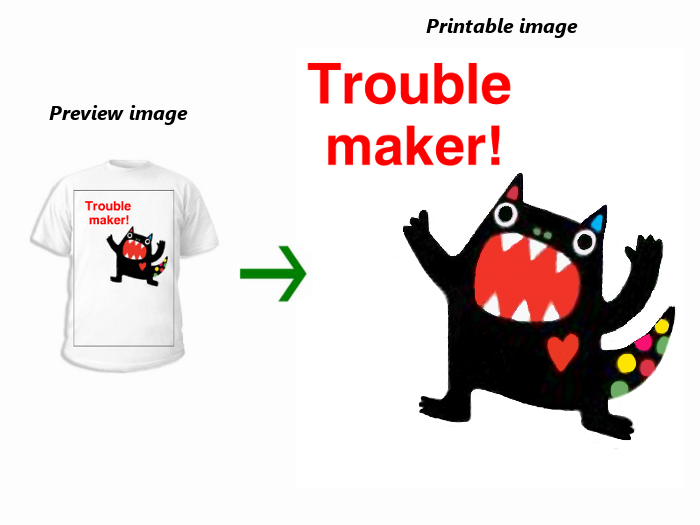 Click "Generate print image" button to download .png image for printing. 3. Click "Generate PDF" button to download .pdf image for printing. Please note! A printable image with the resolution 300 dpi should not be bigger than 800 mm*800 mm or 31.5 inch*31.5 inch . If it is more than noted, it will be impossible to generate printable image because Flash Player has certain restrictions. The image for printing can be represented in .png and .pdf format and involves only the design elements without a product side image or with a product side image depending on your print image settings. The size of the printable image depends on your "Ratio" parameter (how many millimeters you have set up per one pixel).